Trinidad and Tobago attacker Willis Plaza notched the first hattrick since his January move to Central FC as his outfit thrashed St Ann’s Rangers 6-0 in Couva yesterday to ease further away from its mid-season Pro League slump. Plaza has now scored six goals in the last three games and his offensive form took the “Couva Sharks” to second spot, which is their highest placing this season. 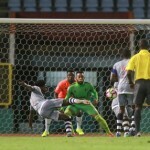 Central and Point Fortin Civic are both eight points adrift of leading team, DIRECTV W Connection, but the Sharks have a better goal difference while Civic has played one game less. 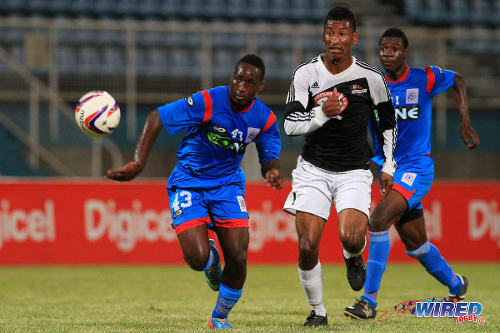 Photo: Central FC striker Willis Plaza (centre) tries to outrun St Ann’s Rangers player Shomarie Antoine (left) while Rangers defender Kevin Carter looks on. In the other half of the table, defending Pro League champion club, Defence Force, pulled off its first win of the year with a 3-0 triumph over eighth placed San Juan Jabloteh in just its second outing since returning to active duty. 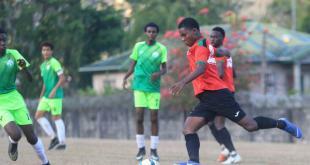 Defence Force remained in seventh spot and trails Police FC by five points; albeit having played four games fewer. If the army/ coast guard combination wins all its games in hand, coach Ross Russell’s men could climb as high as second and within striking distance of Connection. Those four or five wins are still some distance away, of course. 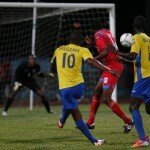 But the “Teteron Boys” at least lifted the mood of their supporters yesterday at the Ato Boldon Stadium. Attacking midfielder Josimar Belgrave put Defence Force ahead after just 10 minutes before Devorn Jorsling scored his fourth goal of the season courtesy of a free kick in the 35th minute. 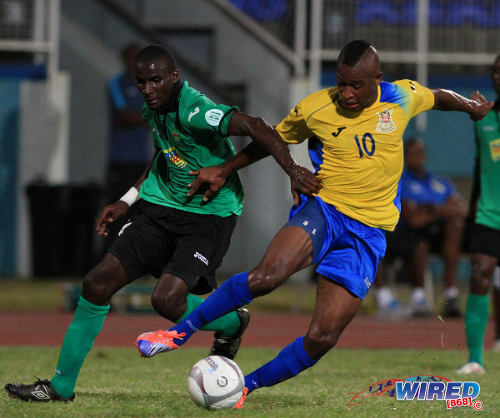 Photo: San Juan Jabloteh player Nyron Jones (left) tries to keep a grip on Defence Force player Josimar Belgrave. 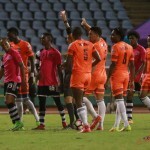 An own goal in first half stoppage time completed another miserable night for the Jabloteh outfit, which managed just five points from a possible 27 in its last nine games and mustered only two goals from its last six appearances. St Ann’s Rangers would empathise. Since club chairman Richard Fakoory tried to replace the likes of Conrad Smith, Keron Cummings and Dwane James with teenagers in the January transfer window, the club has gone eight games without scoring a single goal while conceding 19. The fact that the Pro League does not include relegation arguably makes budget slashing a much higher priority than team strengthening. Whatever the reason for Rangers’ personnel changes, Central cashed in as the youngsters received a fierce spanking yesterday evening. Versatile midfielder Jason Marcano, who scored a goal apiece in Central’s last three games, opened the scoring after just 12 minutes. And Plaza notched the Pro League’s eight hattrick this season while Darren Mitchell and Johan Peltier grabbed a goal each. 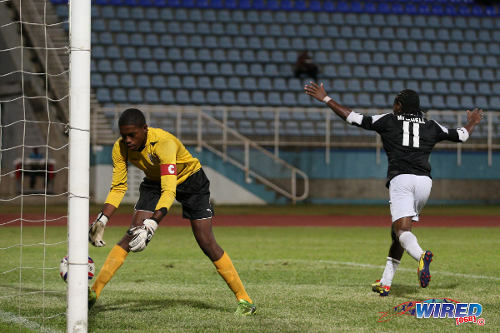 Photo: Central midfielder Darren Mitchell (right) celebrates his first league goal this season while St Ann’s Rangers goalkeeper Terrence Lewis retrieves the ball from the back of the net. The top two Pro League teams will participate in the 2015 CONCACAF Champions League and Central is guaranteed to be in second place until after the Carnival break after three successive wins. The Sharks’ triumphs in 2014 all came against the league’s three bottom clubs. So, despite being the Pro League’s only unbeaten team this year, there is still much to prove. Fourth placed North East Stars and Defence Force will try to edge closer to the top of the table when they clash in a rescheduled match in Couva next Tuesday. Central (4-1-4-1): 21.Jan-Michael Williams (GK); 12.Jamal Jack, 2.Elton John, 50.Yohance Marshall, 3.Keion Goodridge; 10.Marvin Oliver (captain) (4.Sean De Silva 74); 7.Jason Marcano (13.Johan Peltier 68), 6.Leston Paul, 11.Darren Mitchell, 27.Samuel Delice (17.Rundell Winchester 53); 1.Willis Plaza. Unused substitutes: 25.Javon Sample (GK), 5.Julio Noel, 9.Dwight Quintero, 24.Akeem Benjamin. St Ann’s Rangers: 25.Terrence Lewis (GK) (captain); 28.Kadeem Corbin (31.Jameel Antoine 81), 33.Isaiah McIntyre, 41.Kevin Carter, 4.Jelani Peters, 16.Keron Alexander, 26.Josh Toussaint, 43.Shomarie Antoine, 10.Kennedy Isles, 51.Keron Cornwall (50.Kyle La Borde 68), 14.Michael Yaw Darko. Unused substitutes: 1.Akel Clarke (GK), 5.Keon Peters, 30.Rickyl Morris, 39.Shaquille Moses, 21.Jair Edwards.